Philly to LA on Foot: Philly to LA on Bike? Philly to LA on Bike? Though I had been planning to do this for a while, I finally went out a couple of weeks ago and bought a bike. I bought a Giant Defy 2 which is a decent bike, not ridiculously expensive, but not cheap either. If I end up riding like crazy, I'll upgrade at some point later. 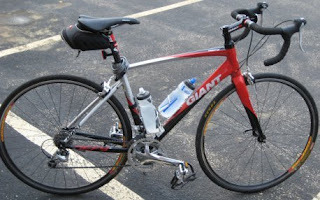 And, since I can't do anything small, I took it out the next day and rode 9 miles, and then rode 40 miles the day after. Who says you have to start slow? It was amazing to me how little I needed to start out slow. We use similar muscles between running and biking, but I didn't have any pain after the 40 mile ride and in fact when out the next day and rode another 15. As for cross training, I'm finding that I can ride one day and run the next without any pain or sluggishness. On the running side, I find that I'm running a bit faster. I can't tell you how much I needed something to break up the constant pounding on the road. I needed it to keep my body together, but I really needed it to keep me sane. I find that I really look forward to rides and to runs as well because I'm not doing the same thing every dang day. congrats on the purchase of your sweet-lookin' bike! Do we see a tri in your future now?! I love varying my running with biking, and have read that it can help with running speed as well! Thanks for the msg on FB too! :) Appreciate it! I've been toying with the idea of getting myself a bike (for almost a year, actually). I think it would bw good for the joints and muscles. Great looking bike. Your post has me thinking that there's a bike purchase in my future too. Congrats! I know you'll continue to enjoy that bike. Love the new ride!! I started to see the biggest leaps in my running once I started biking last year. And now the improvements with running and biking go hand in hand. You'll love it. Just watch out...you may want to race a duathlon...or even a triathlon next! Nice bike! Well done that looks fabulous. I am seriously tempted especially given the benefits you're noticing.. Hmmmm.